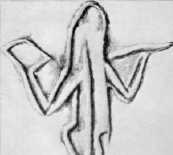 Very ancient rock engraving of a female(?) archer from Wadi In Habeter in southwestern Libya. The Berbers are not a closed ethnic group, but consist of numerous, partly very different groups. Moreover, they are distributed across a huge region which reaches from western Egypt to the Atlantic coast of Morocco. Even on the Canaries there had existed Berbers - the so-called Guanches, but there had been exterminated in the course of time. Their roots can be traced to antiquity, bearing the names «Numidians», «Gaetuli» and «Garamantes», which can been equaled with the Berbers. The most famous Berber people are the Tuareg who by living on the fringes of the Sahara desert are rather secure from foreign occupation and external influences and so have been able to preserve their nativeness. Linguistically 3 main groups of Berber dialects can be discerned. Zeneta. This group roughly comprises the Berbers from Libya, Tunisia and Algeria with the exception of the Kabylie. Sanhadja. This dialect is spoken in the Kabylie, in the Tuareg region, in the area of the Middle Atlas and in the central area of the High Atlas. Maçmoûda. This group comprises Morocco, the western High Atlas, the Anti-Atlas and the region west of it (Rif). It is characteristic for the Berbers that they live very dispersed and have no want for political unity. Then they are well-known for their anarchistic attitude. A supraregional national consciousness does only seem to exist on a very small scale, efforts to found an own Berber state were rare, the effort in the present time to found a Tuareg state in the north of Mali, under the name «Azawad», didn't last for long. Although the Berbers had been Islamized more than 1000 years ago they succeeded in preserving their unique way of life and their special civilization. Actually, it is very amazing that the Berber women could keep their high social status in Berber society withstanding the strong influences of patriarchal Muslim culture. This is already obvious by the fact that - in contrast to other patriarchal people - the education of the girls is of great importance. In fact, there are the Berber women who can read and write, do poetry. Also in case of matchmaking the women are the active part, they choose their husbands. Therefor it is not very astonishing that there existed famous Berber queens who were also military leaders. The most famous of them, Kahina and Tin Kahina, will be treated in detail. One of the most famous figures of Berber history is Kahina. 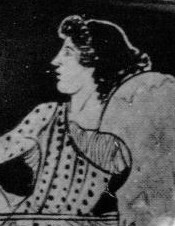 This Berber chief from the Aurès in eastern Algeria, presumably of Jewish origin, led the resistance of the Berbers to the Arabs in the seventh century and proved herself to be a very dangerous opponent. Kahina - the name means «prophetess» - mobilized the Berber of the Aurès and formed a powerful army. Under her leadership the Berber troops were able to defeat the Arabs severely several times. This fierce Berber resistance was the reason that the Arabs founded Tunis. Only with great efforts the numerically superior Arabs succeeded in defeating Kahina and killing her in the end. Her determination in resisting the Arabs by all means becomes quite obvious by the fact that she even surrendered her sons to the Arabs to keep her freedom. Maybe this is also a hint that Kahina was leading a Berber people with a society that valued women more than men. The ancestress of the Tuaregs was a woman, who possessed many characteristics of an Amazon queen. Her name was Tin Hinan. The strongest impression of genuine Berber culture conveys the people of Tuareg. This people lives in the Sahara desert and because of its seclusion could preserve its uniqueness. Only in the beginning of the 20th century the French succeeded in subduing this proud people! Every year in May, on the 13th of May to be precise, there takes place a spring festival named Mâyu in the town Tozeur at the northern border of the Chott el-Djerid. It is a festival which is quite uncommon for Islamic way of life. At this day the land tenants set up swings in the palm tree groves and the young women, the young girls and also the small ones have much fun swinging. 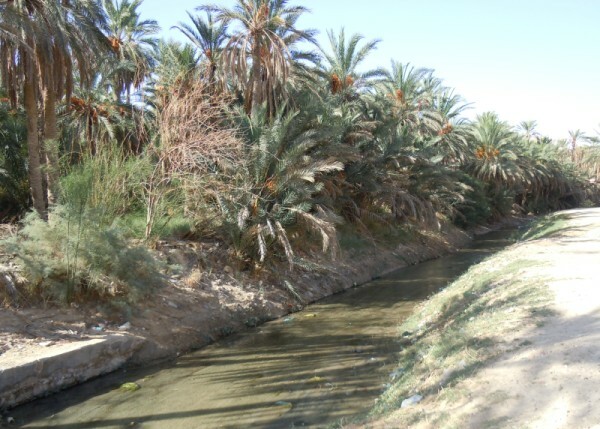 Actually, the main event takes places at the Oued, the water channel which is essential for Tozeur. In the morning these women who are allowed to leave the house for the festival - women of wealthy families are excluded - go to the Oued to take a bath in there. Similar to the swinging in the palm tree groves there is much joy, fun and laughter. The young women do special rituals in the Oued. They open their hairs, sprinkle each other with water und say an incantation. The married women take water from the Oued and bring it home. By saying a spell they change it to an aphrodisiac which is supposed to strengthen the love between their husbands and themselves. It is quite obviously a festival with the focus on women. The scientists mainly agree that the origin must be a pre-Islamic vegetation festival. Already the date in May hints at its fertility nature. It is very remarkable that it is a women's festival and actually exclusively for women. It is all the more amazing because Tozeur is totally Islamic. The only role of the men at the festival is to set up the swings. It is a festival of young women and girls but also of married women. The main event takes place at the Oued, the lifeline of Tozeur. Without these natural water resources Tozeur could not exist. Water is undoubtedly connected with fertility. Without water there would be no vegetation and no life in the Djerid region. The sprinkling with the valuable water of the Oued is to be interpreted as a fertility ritual. The fertility of vegetation is connected with the fertility of women. The exclusion of the rich women from this ceremony hints at the egalitarian meaning of the festival. It is even possible that it implies a latent reminiscence of a past egalitarian civilization which revives for one day a year with this festival. Actually, it is very amazing that the Mâyu festival - as a women's festival - could preserve itself in its current form in today's North Africa. First of all, the Libyan Amazons were located in that part of Africa where the Berber peoples lived and still live. The Berbers are supposed to be aborigines. The Berbers call themselves »AMAZIGH« in their language. There is definitely a strong similarity between the words »AMAZON« and »AMAZIGH«. A further astonishing fact is the preeminent position of women in Berber society, though it depends to which extent the Berbers were absorbed by the Arabs. For about 1300 years the Berber peoples were threatened and in fact for the most part conquered and at last absorbed by Arab invaders. There was a significant historical event at the first Arab invasion about 700 A.D. It was a female Berber leader named Kahina, who very successfully put up a fierce resistance to the Arab conquerors and even succeeded in driving them back, though in the end she was defeated and lost her life! Kahina led her life in the tradition of famous Amazon queens like Penthesilea. Isn't it very plausible that she was a descendant of the famous Libyan Amazons? But the conquest of the Berber peoples was rather complete, so only the most secluded tribes have preserved their unique Berber culture. Even today there are amazing parallels between the Berbers and the tradition of the Amazons. 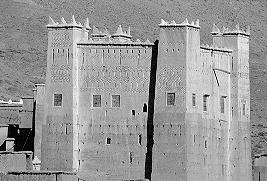 So there are fascinating Berber fortresses which have a strong resemblance to the picture of the Themiskyra fortress on a Greek vase. The conformity of tower battlements on both representations is very remarkable! 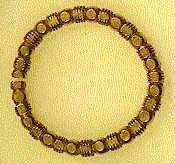 But even in social life of the Berbers there persisted elements of their unique culture. For the most part only the Berber women are literate and exclusively they know to write a special alphabet, the Tifinagh, which is founded upon the ancient Libyan writing. So it is not very amazing that literature and poetry are handed down by the Berber women! This comprehensive overview shows these disparate peoples in their immediate social environments and how they retained a separate identity among more dominant cultures.